Visit us at OIST: State-of-the-Art 3D Tissue Culture & Organoids 2019 (Apr 18-20, 2019) at Seaside House (Okinawa, Japan). Learn about our technology at the 18th Congress of the Japanese Society for Regenerative Medicine held on Mar 21 – 23, 2019, at Kobe International Conference Center (Kobe, Japan). Find us at “Cardiovascular and Metabolic Week 2018”, Dec 7-8, 2018, at the Tokyo Convention Hall (Tokyo, Japan). Meet our researchers at the 41st Annual Meeting of the Molecular Biology Society of Japan on November 28-30, 2018 at Pacifico Yokohama (Yokohama, Japan). Learn more about us at the 31st Annual Meeting of the Japanese Society for Alternatives to Animal Experiments, Nov 23-25, 2018, at Booth# 6, Sojo University (Kumamoto, Japan). We will be exhibiting at the 91st Annual Meeting of the Japanese Biochemical Society on Sept 24-26, 2018 at the Kyoto International Conference Center (Kyoto, Japan). 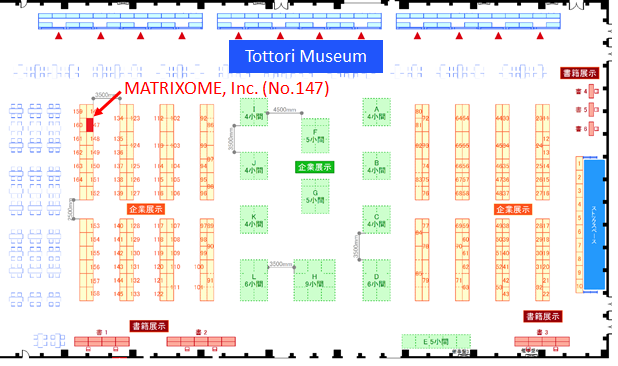 On upcoming September 4-7, 2018, we will exhibit at “TERMIS World Congress-2018 Kyoto JAPAN” at Kyoto International Conference Center. Division of Matrixome Research and Application Institute for Protein Research, Osaka Univ. Venue / Buzz Hall, B1F, Bldg. 4, West Area, Kyoto Research Park. Updated about overseas sale of iMatrix – 511 & iMatrix – 511 silk. Click here ! On upcoming December 6-8, 2017, we will exhibit at “ConBio2017” at Kobe port Island.